Private-equity firms are doubling down on energy, despite heavy damage from their last adventure in the oil patch. These firms’ stakes in a dozen publicly traded energy exploration-and-production companies have lost more than $18 billion in value since last summer, when oil prices began their slide from more than $100 a barrel. Yet with U.S. crude prices down to about $46.75 a barrel at Thursday’s close, private-equity firms are looking for opportunities to spend the hundreds of billions of dollars they have amassed to make new energy investments. They are hoping the commodity-price crash will open up opportunities to pick up assets and entire companies on the cheap. “This is a temporary situation, and investments that are made in this low-price environment are going to look pretty good two or three years out,” said Mark Papa, who joined energy-focused firm Riverstone Holdings LLC earlier this year after retiring as chief executive at EOG Resources Inc., one of the largest U.S. energy producers. So far, deals have been somewhat scarce. Earlier in the year, struggling energy producers raised record amounts of cash by issuing stock and selling new debt to investors willing to throw them lifelines. Private equity bet big on the oil patch over the past decade. Many deals from the early years of the shale boom were immensely profitable for firms including Apollo Global Management LLC, KKR & Co., Warburg Pincus LLC and Blackstone Group LP. They arrived early to regions where new drilling technology unlocked reserves trapped in dense rock formations and made money selling the properties to big oil companies. But after oil prices slid, many of their investments took a hit. The value of a controlling stake in EP Energy Corp. held by an Apollo-led group is down roughly $3.4 billion since June 30 of last year as the oil producer’s shares have fallen 71%. About $8 billion in paper profits slipped away from a Warburg-led group that launched Antero Resources Corp. in 2007 and holds a majority stake in the Appalachian energy producer. Stakes in public companies like EP and Antero offer only a glimpse at the damage low oil prices have done in private-equity funds, which lock up investors’ cash for several years and combine it with borrowed money to make investments. Closely held companies, which make up the majority of private-equity investments, also have declined in value. Samson Resources Corp., for example, is planning a bankruptcy filing that would wipe out about $4.1 billion that a KKR-led group pumped into the energy producer. The diminished value of such holdings has stung even the best-performing funds. Annualized returns for investors in a Blackstone energy fund fell to 28% after fees as of June 30 from 52% a year earlier, according to securities filings. The situation is far worse for some struggling funds. Energy-focused First Reserve Corp. told investors earlier this year that a pair of its funds, the two largest energy-only private-equity pools ever raised, fell below break-even. If they don’t return to positive territory, the $7.8 billion pool raised in 2006 and $8.8 billion fund raised two years later will join a small group of multibillion-dollar private-equity funds that have lost money over their lifespans for investors. Annualized losses in a $900 million KKR natural-resources fund from 2010 grew to 38.9% after fees at the end of June 2014, more than double the percentage loss from a year earlier. That fund invested largely in producing wells and cut deals with companies to finance drilling projects. But this being the deal business, the deal makers aren’t giving up. Private-equity firms have $115.6 billion available for energy deals, according to Preqin, a private-equity data provider. And they are looking for more, pitching pensions, endowments and other big investors on 67 energy-focused equity funds that aim to raise about $29 billion more, the data provider said. The firms also have amassed about $80 billion to invest in energy-company debt. Including the borrowed money they typically use to fund deals, private-equity firms’ energy-buying power stands at more than $300 billion, roughly equal to the stock-market value of Exxon Mobil Corp. , said Ralph Eads, who leads energy banking at Jefferies Group LLC. Where some private-equity firms tripped up in the past was treating drilling properties equally, said Riverstone’s Mr. Papa. “They really haven’t discriminated yet regarding what is good quality,” he said. Private-equity executives and bankers say many firms have become smarter buyers since the first wave of deals, enlisting technical experts such as petroleum engineers and geologists as well as big-name oil executives to help them vet prospects. “The financial players are getting to where they can behave like an oil company,” Mr. Eads said. “I see much more opportunity than I see downside for us in the energy space,” Apollo co-founder Joshua Harris told investors recently. While volatile energy prices and cheaper financing sources have kept private equity on the sidelines, some firms are starting to open their coffers. Blackstone’s debt-investing arm, GSO Capital Partners LP, recently reached a deal to help fund a closely held energy producer’s purchase of Encana Corp. ’s Haynesville natural-gas fields in Louisiana. Declining natural-gas prices battered some earlier energy investments, such as KKR’s Samson, but lately the fuel has been popular among bargain-hunting private-equity investors. 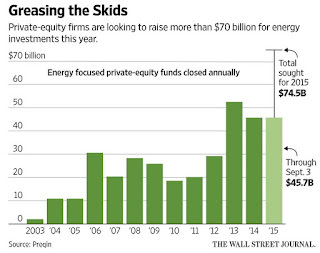 So, even after huge losses, private equity funds still see big opportunity in energy? I sure hope they're right betting big on a global recovery because they've been losing a ton of dough for their clients investing in this sector. 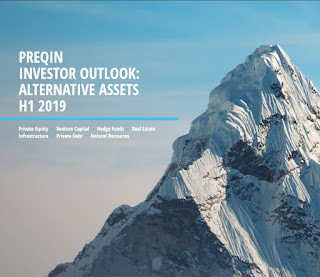 The majority of private equity investors expect outperformance of more than 4 percentage points above public markets from their allocations to the sector, research from Preqin has found. 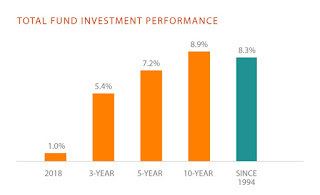 A survey of more than 100 institutional investors in June this year showed 49% were expecting such outperformance, compared to the 35% with similar expectations in June 2014. A further 39% quizzed this year felt their allocations should outperform listed stocks by 2 to 4 percentage points. “Between 2013 and 2014, a notable period for bull market conditions with significant stock market highs, there was a decrease in the proportion of investors that expected their private equity portfolios to beat the public market by more than 2%,” Preqin reported. The uptick in expectations may have been driven by “the apparent success of respondents’ private equity investments in the last 12 months,” the data firm suggested. While the performance of private equity funds has undoubtedly improved in the short term—roughly a third of respondents (35%) said their expectations were surpassed in the past 12 months, compared to just 12% in June 2014—investors in different regions varied in their satisfaction with managers. 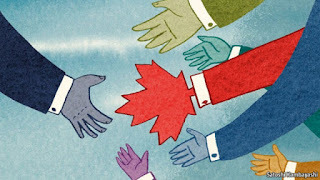 In North America, 35% of investors said performance “exceeded expectations”, compared with 43% in Asia and 50% in Europe. Investors outside of these regions were the least satisfied: just 25% reported better-than-expected returns for the year to June 30. Paradoxically, while Europe had the most satisfied investors, it also had the greatest proportion of dissatisfied private equity buyers: 19% said their allocations had “fallen short of expectations”. However, 40% of investors said alignment of interests could still be improved when it came to management fees, and 32% said the same for performance fees. Preqin’s report showed continued signs of difficult conditions for the sector’s operators, however. Unused cash rose to $965 billion in June, nearly half the total estimated capital invested in private equity. 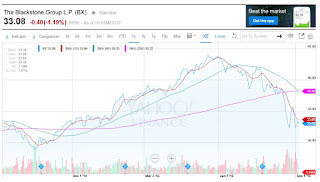 In a July interview with “Wall Street Week”, industry luminary David Rubenstein argued that this capital was likely to be deployed as soon as there was a market correction—much like that seen at the end of August. Fundraising fell in the first half of 2015 compared with the same period last year: $253 billion was raised by 509 funds, down from $272 billion in 656 funds in the first six months of 2014. Preqin speculated that the record amount of dry powder held by private equity funds was likely to blame for this, as performance and money returned to investors have continued on an upward trend. Observers on the whole are amazed at the stickiness of private equity’s 2% management fee. “It was one thing when funds were a couple hundred million dollars and you needed to run a business. It’s another when the assets are in the tens of billions,” says Grabel. 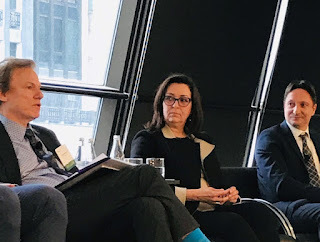 In the bifurcated market Scheer describes, LPs don’t have much fee power in the high end—although he believes that it is changing at the bottom end. Some asset owners view a co-investment program or separately managed account as a way to have more control and reduce management and carry fees. Based on this interest, more than half of the GPs in the Preqin report said they are aiming to increase their co-investment offerings. When Cukier started his first job in private equity in 1997, the head of the firm gave him an article from the New York Times about the industry’s imminent decline thanks to a falling rate environment, excess capital being raised, and a plethora of new market entrants. “I read it and I was horrified,” he recalls. “What business did I just get into?” Then he saw the dateline—it was written in 1982. The death of private equity has been foretold many times. There is even one commonly expressed view that the current boom is happening because the private equity market has become a proxy for going public. There is enough liquidity to make it more efficient than it used to be, and there are fewer regulatory burdens to an initial public offering than there once were. Let’s hope they aren’t the only ones, and that asset owners have partnered with the right GPs in the currently crowded field—come rain or shine. My thoughts on private equity? It's an extremely important asset class, now more than ever as investors look to reduce their exposure to volatile public markets. But investors need to be careful here and diversify their vintage year risk, geographic and sector exposure and most importantly find GPs which will provide truly "top quartile" results and the best possible alignment of interests. Some think private equity is cooked in an environment where valuations keep creeping up and strategics are awash in liquidity. 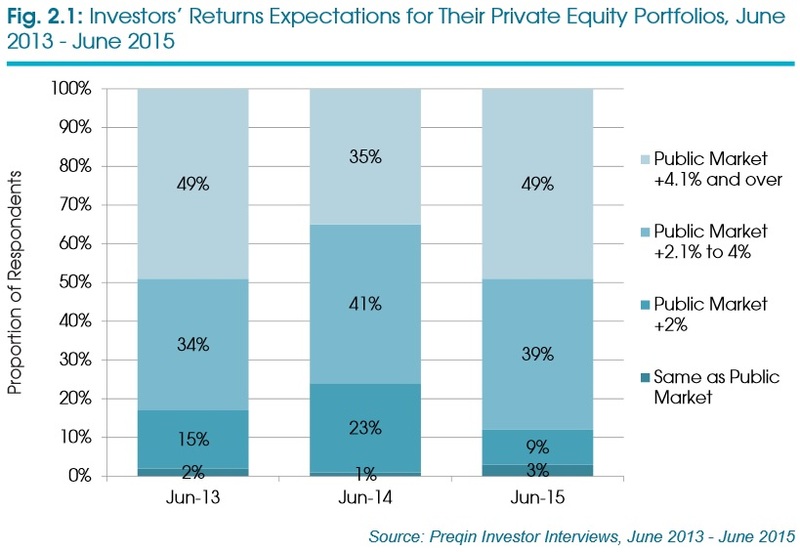 I'm not as cynical but I don't think private equity is a panacea, especially if public markets get clobbered. It will provide a cushion to pension funds as valuations are lagged ("valuation diversification") but if public markets head south, it will eventually catch up and hurt private market investments too. One thing is for sure, it's the end of an era for private equity superheroes. Investors are increasingly placing pressure on funds to lower fees and get a better alignment of interests. They're sick and tired of private equity firms stealing from them and a few big funds are following the Dutch, bypassing private equity funds altogether. It hasn't been much better for other private equity giants like The Carlyle Group (CG), KKR & Co (KKR), Apollo Global Management (APO) and Oaktree Capital Group (OAK). All of their publicly listed shares are well off their highs of the year and it remains to be seen whether this is a cyclical downturn or something more ominous for private equity as a whole. Oh well, I hope that big bet on energy pays off for some of these firms. And even if it doesn't, they still get to collect that 2% management fee no matter how well or poorly they perform! Below, Scott Brown, Raymond James chief economist, shares his thoughts on August's nonfarm payroll numbers and its impact on the Fed's decision to hike interest rates. And Alan Knuckman, Bulls Eye Options, discusses the action of oil as it settled higher after a steep decline. When it comes to oil, I listen to guys like Pierre (not Philip!) Andurand of Andurand Capital. Andurand thinks the market has overreacted to signs of slowing US crude production and comments by Opec. He believes prices will head lower again, possibly dropping below $30 a barrel over the next couple of years. If he's right, private equity funds doubling down on energy are in for a long, tough slug ahead (also see the FT clip below). Lastly, fear about a Federal Reserve rate hike sent stocks lower Friday, but next week investors are going to refocus on China—which will be the key driver of equity prices over the next couple of months, according to noted strategist Russ Koesterich. Koesterich said there's a reason investors are reacting "violently" to a possible rate increase. "If the Fed were to hike, they'd be hiking in an environment where inflation expectations are falling. That means real rates are rising faster than nominal rates. 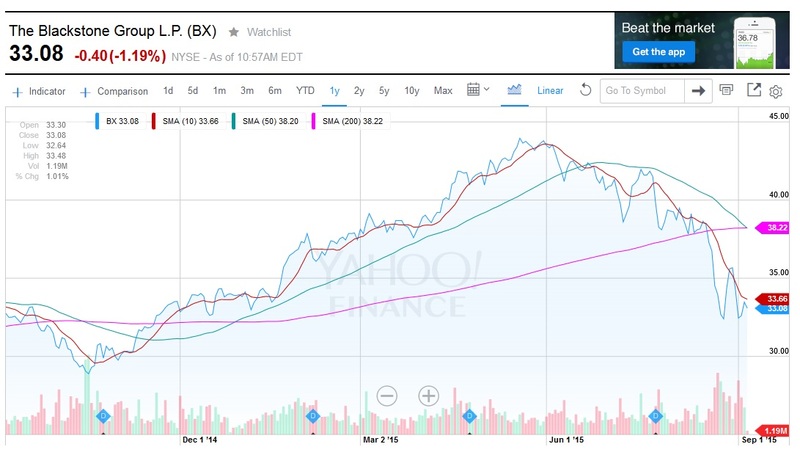 In the past, that's been when you've seen the more severe corrections in equity markets." Hope you enjoyed reading this comment and all my other comments this week. 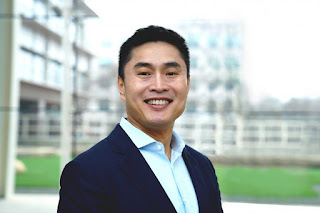 I work hard to provide you with the latest insights on pensions and investments and remind many of you, especially institutional investors which regularly read me, to please subscribe to my blog or donate to support my efforts. Have a great long weekend, and relax, we're not in a big bad bear market, at least not yet!